Send us your requests and we will contact you shortly with all the answers you want. 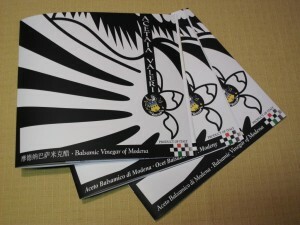 Catalogues Acetaia Valeri Italian market, English, Chinese, Polish, etc. “the real "natural" balsamic vinegar is made from a cooked grape must, matured for slow acetification and progressive concentration through very long aging in a series of ships of different Woods, without any addition of aromatic substances. Shiny dark brown color, expresses its density in a correct, viscosity sliding. Has distinctive aroma and complex, penetrating, to clear but pleasant and aromatic acidity. Of traditional and inimitable well-balanced sweet and sour taste, you generously full, savory with velvety nuances in accordance with its own olfactory nature "
To purchase our proposals we suggest you submit your need to which we will respond with our best offer to which, in case of cumulative quantities (with friends or relatives), or the whole amount foreseen by our box, In addition to avoiding the spending provided for amounts contributed under 300 Euro, You can apply important discounts. We will send you our answers and the best offers in addition to essential tips to best utilize our balsamic vinegar, in the kitchen or directly on your table. NB: Always remember that everyone gives off different feelings from one person to another, Therefore, There is no guarantee that the pleasure of taste is shared by everyone at the table. Fair trade groups we apply special promotions discounts and savings made!